Here is a quick and easy sandwich recipe to make at your next party. Recipes like this are great to add to the weekly menu plan for a week night when you will be short on time. 1- Heat over to 350 degrees F.
2-Melt butter and then mix in mustard, Worcestershire sauce, onions. Simmers for 5 minutes. 3-Cut all the rolls in half horizontally. If using the King rolls, keep the rolls together and just slice the entire package in half. 4-Lightly grease the bottom of a 9 x 13 pan. Place the bottom half of the rolls into the pan. Spread 1/2 of the onion mixture over the bottom of the rolls. 5-Add the ham and then cheese. 6-Replace the tops on the sandwiches. 7-Spread the remaining onion mixture over the top. 8-Cover with foil and bake 15-20 minutes. Separate when ready to serve. Keep warm in the foil. Oh, my goodness those look delicious! We love sliders of various kinds and I'm definitely bookmarking this one to try! Yum, this looks fabulous! Thanks for sharing!! 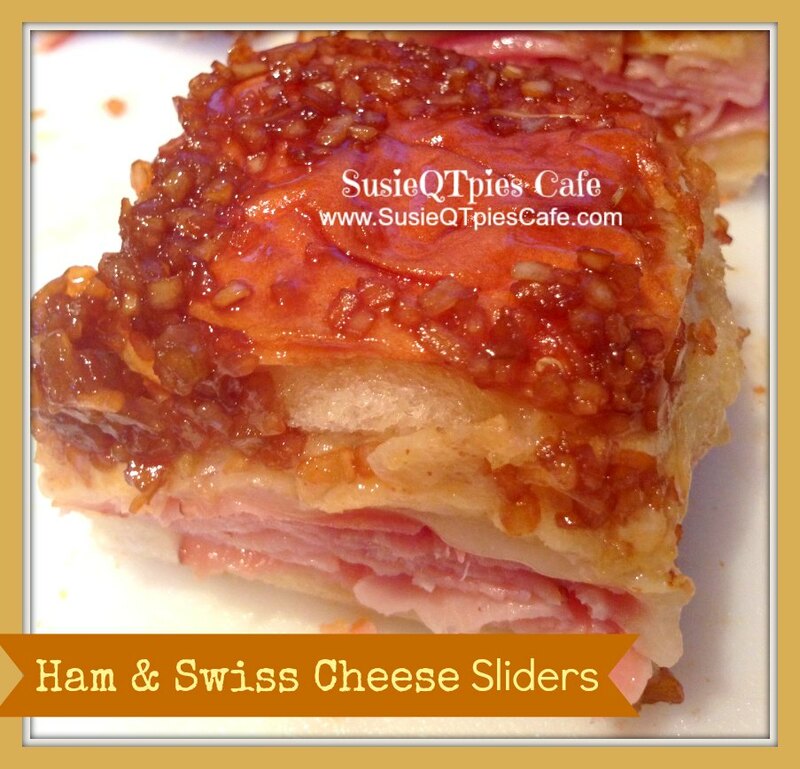 We just love Sliders and will have plenty of left over ham to make these awesome little sliders. Hope you are having a great weekend and thank you so much for sharing with Full Plate Thursday. O my goodness! How delicious!!! ooo that looks yummy! I love swiss cheese!!! Thanks for linking up to Tasteful Tuesdays! Always love to see what you bring!! Really appreciate you stopping by my blog! I’m trying to keep in better touch with my linkers/readers… If you already follow me, please let me know I will find your blog on Bloglovin (I’m transferring my follows there)if you don’t follow in any way, would you consider following via GFC or other method? How wonderful for Easter leftover ham! yummy! Thanks for linking up to Tasteful Tuesdays! I was hoping to feature you but didn't see a link back. If I am mistaken please let me know and I will add you to my sandwich round up! hope to see you at the party again this week!